Its done finally, altough gameplay/item placement might need some additional work. Shouldn't be too hard for most of you, a few tougher traps here and there. Enjoy! Btw, IDCLEV to map 02, I just noticed. Cool map Dutch. Nice architecture as usual. I had a blast playing through this and it took me just over 30 minutes to get to the end with just one secret missed. i really really liked it, always nice to see such nice, non-overdone detail using stock textures. This looks quite amazing, I want to play this!! 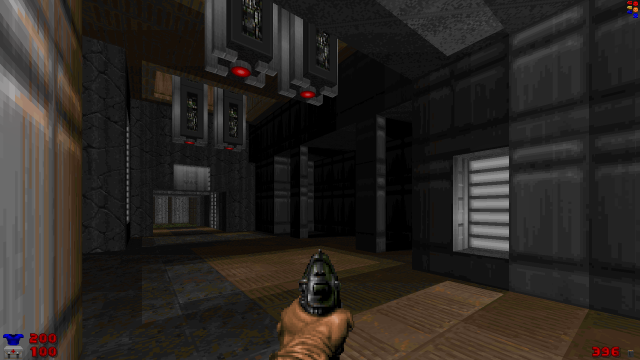 There's something odd about the teleporters (in zdoom anyway). After teleporting, when moving off the destination pad, often (but not always) I am teleported back to where I came from. The problem seems to be due to the sector shape (square pads but with 2 pointy protrusions on each side). Perhaps removing the teleport action from the pointy bits would fix it. Possibly a bit overly generous with ammo. I had 400 cells near the end and so just went crazy with the plasma rifle. I did use the chainsaw a lot earlier though so that might be why I had so much ammo spare. Very pretty map. I have been trying to get a monochromatic look in my levels, using many of these same textures. I really like what you did. Certainly looks more like concrete than the "concrete" texture. And nicely placed secrets. This map definitely made me use spatial awareness to get around and find stuff. The first steps downward have a rather low ceiling at the bottom that I tend to hit my head on, albeit not every time. The caves could be a shade darker. Certainly around the mine cart area. It felt weird not being able to jump out the window after the 200/200 Sphere. Why? Weaponwise- I think subbing out the SSG for a Beserk Pack would be a good move. I really didnt even prefer using the SSG in most fights. It would be cool to punch Barons instead of SSG those guys. SSG is a bit more Revenant/Mancubus/Archvile. Played this in PrBoom+ and encountered minor HOM, so I don't know if it's ZDoom only. Here's a fda anyway. 1. Is been fixed noticed this too yesterday, got in an infinite loop and a Chaingunner got me eventually. 2. I agree, I need to tone it down a bit. or add more monsters to balance it I guess. Thanks for the feedback and for playing. The ceiling is indeed a bit too low at the bottom of the stairs, I will correct this. I was not sure if the caves were too dark or just bright enough, thought if it got too dark it would the frustrating, but I can work on that. The window is indeed too small, you would be able to jump on the rocks and skipp half the map I think, need to check this. Switching SSG for Berserk, check I will change it, as you said the SSG doesn't get used much, maybe for the Barons...Good points here thanks. Thanks, will take a look, as soon as I get back from work. Will probably have a new version up by this weekend. I checked out your map, and I enjoyed it. I found the ammo to be on the plentiful side, myself (as can be seen at the end when I had a couple hundred cells and 100 shells). I did default to the SSG, most of the time, and still had a lot of ammo. I agree on the teleporter bit (it might be worth it to have a smaller sector just inside the ribs that has the actual teleporter lines). Architecture was on point, and I must say I envy your natural architecture. It was a bit bumpy to move about, but I liked it all the same. Layout I felt was very strong. I never really got lost, only turned around once or twice, and I was otherwise able to navigate the map quite well. I honestly expected something like an archvile in the exit room (which wouldn't be a bad idea, in my opinion), partly because I knew I missed a monster and partly because the map had been mostly easy enough to deal with (the two times I nearly died can be chalked up to me not paying enough attention). Overall, strong map, I look forward to more from you. Ammo is indeed plentiful, too much actually, I'll work on that some more. I honestly don't know if I should add more monsters, guess its better to lower the amount of ammo throughout the map. A bit more work on gameplay, and it'll play even better. Thanks for the Reply. I played this a few more times to get the feel for it better, and contemplate that ending. I really like the look of this map and would love to see its gameplay to be par with your sector and texture work. Which I dont think needs much. But take your chainsaw placement: after picking it up, Imps snipe at you and then Imps and Sarges teleport in @ Mine Cart. You pick up a chainsaw and really dont have ample time to use it. I think if you subbed out those teleporting Sarges for Demons, my Doomguy will be more likely to use the chainsaw. Additionally, its too obvious that the area is a trap. 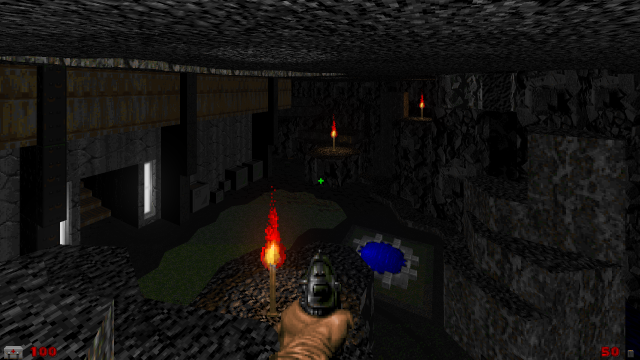 Having 3 or 4 Cacodemons hanging out in the Mine Cart Area would likely entice Doomguy to begin circle strafing the small arena and lulling me into the Yellow Key Trap. This would also lower overall Shell Count. That SoulSphere Window just bugs me. The gameplay moves as a quick pace until that Window. It shows you an area you back tracked, but you have to back track to get to it. And then there is a Dang Revenant- who cant deal any damage to you, and you cannot deal much damage to him. And everything just slows down too much. I dont know if you want to touch the window or not, but subbing that Dang Revenant for a Chainguner would work well to speed up the gameplay. Regarding the SSG area: I think you should just nix the Backpack. Doomguy is probably at 50 Shells and 100 Bullets when he reaches the SSG, and the backpack is just too much. There are like 5 Chaingunners right after that, and this is really where Ammo goes deep. The Rocket Launcher is also right around the corner. I would also suggest nixing the Boxes of Shells @ 2nd Outdoor Area (After the Rocket Launcher) and the other Box of Shells in the Baron of Hell Room. Likewise there are a few too many Stim Packs around this sequence as well. Either the Chaingunner Squad killed me or it didnt- it is unlikely I am at 10% Health. Adding a couple Cacodemons to the exterior parts, especially the Outdoor Area Before the Barons of Hell, would liven up the middle of the excursion- which I think has a significant drop in Monster Count compared to the rather high octane start. You also go with Imp Snipers whereas the first Outdoor section was mostly Sarges / Chaingunner Snipers. It would be cool to pick up the intensity in this area a bit with Hitscanners, Cacodemons, and maybe a few more dudes on the ground. Lastly, the Archvile needs a friend. I think an Arachnotron in front of the guy woud be perfect to block Doomguy's path and provide a beefy shield. Thanks again for this treasure. Initially I wanted to make a secret teleporter taking you to that room with the Soulsphere, I think I should have sticked to that. See what I can do about that Revenant, might be a good idea to put a monster teleporter up there where Cacodemons spawn from. Or just a few Imps up there. Backpack I can put in a secret room somewhere, maybe where the RL is, or remove the RL from the map completely, or keep it in with a limited amount of rockets given to the player onwards further into the map. Already switched or removed the Boxes of Shells. Overall the map is quite rich on health boxes. I think you refer to the area outside with the large guard tower where you find the red key, that is indeed low on body count, and really could use more there. Building the Map was the easy part lol. Good Luck Buddy. Ill check out your other stuff. I do have nightmares about misplaced stimpacks. Again, great texture use and brilliant map. Played keyboard-only because I'm in bed. Reminds me of CC3/CC4 styles: low ceilings, orthogonal contours, emphasis on smaller-scale detail rather than ambitious architecture, even an exit archvile for that vintage feel. Seems well done enough within that mold. The computer consoles look sleek and pretty, I haven't seen crates done with that exact scheme before (that particular choice of 'interior'), and the same for the flats that crisscross the stairs. I do agree that the caves might be better off darker. The seemingly deliberate emphasis on low-tiers prevented the map's incidental/frontal focus in hallways and such from becoming a slog. The occasional traps helped there too. - A number of HOMs outdoors and in caves in prBoom+. These appear to be flats used as textures, a ZDoomism. 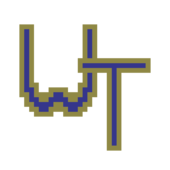 - The jagged 'detail teleporters' are wonky: teleport, and then move off your destination at certain angles, and you can end up crossing one of the jutting lines that is parallel to you and teleporting unceremoniously back. Happened a couple of times. An easy fix is limiting the teleport triggers to the usual square, leaving the ornamentation purely cosmetic. - One of the red key doors can't be opened by 'use', another can, both look the same. After the first, I thought the map was broken for a second and then remembered about the other red door. A different look is indicated. - The yellow key trap's transparency, coupled with the area's geometry, made escaping it a pretty intuitive thing to do, and there is only light resistance (some low-tiers that warp after a short delay), so that was effortless. Being the curious sort, I replayed it while staying put, and it turned out to be my favorite fight in the map. This is a case where I'd probably suggest making escape harder despite the map not being the 'controlling' sort: if only because it's easy to do that and never appreciate the fight. 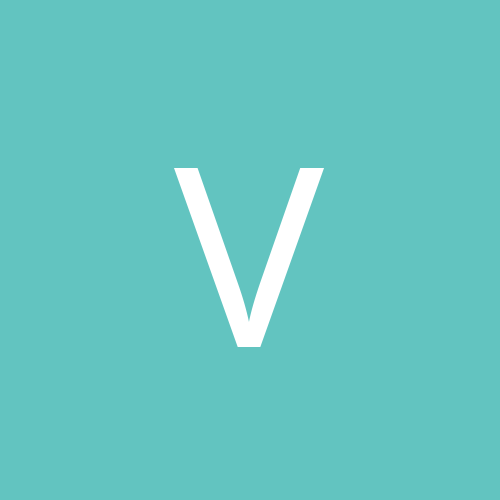 - A lot of rooms presented the approach of moving forward into them to show your presence, and then immediately backpedaling to the chokepoint deal with what follows you. None are bad at all on their own -- that it recurred so often started to be amusing. - Two separate secrets for the computer map and bulk cell. They are in the same room, behind identical barriers, and not too important. Probably better joined into one sector. I never knew you could play a Zdoom map in prBoom+, I did not test the map on that port as I thought you couldn't play it with prBoom+. I did not know that. Teleporters have been fixed and working properly now. The two red doors might become confusing, I think changing the one operated by a switch should be a normal door instead. I tried blocking off an escape route for the player by having the monsters teleport in more densely near the exit of the mine shaft area, I think that is indeed one of better fights if you stay put, it might be the only one for now. I can make the computer map secret at the end into one secret, I think thats better. 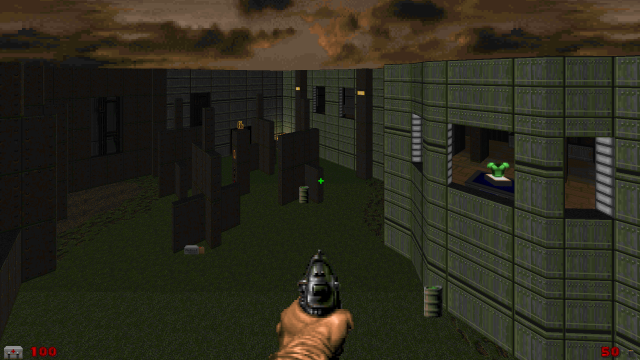 I think if you built the map in ZDoom (Doom-in-Doom) format, then yes, you can, many of the actions are similar to Boom format, but if you use certain actions (like those that came from Doom Legacy or Vavoom or something), they won't work. PRBoom will automatically close if it detects the map being loaded to be Doom-in-Hexen or UDMF, however, and tell you it can't run the map in that format. A thanks mate, this old dog still learns new tricks every now and then. 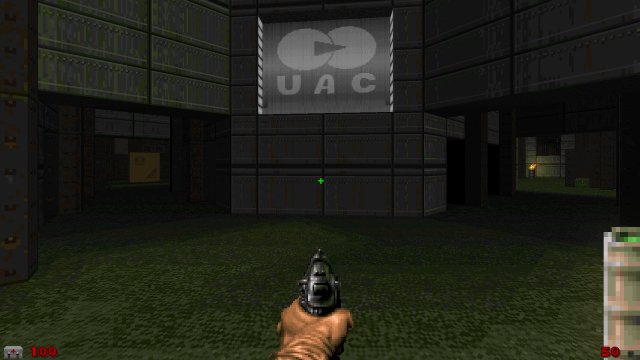 The map is indeed in Doom in Doom format. Need to figure out an easy way to fix this issue. I did some quick searching, having remembered a program exists to convert Doom-in-Doom to Doom-in-Hexen, and found the ZDoom Wiki page for it. You should be able to get it from the link embedded on that page, otherwise you'll need to do it by hand, as far as I'm aware. So if I convert the map in Doom Builder to Hexen format, many if not all actions cease to work right. Right, and you'll need to fix them all manually. I believe that ZWADCONV deals with that for you, but I can't say for sure as I've never used it. If you want it to be a ZDoom map, saying it's a ZDoom map should be enough, without any other changes. 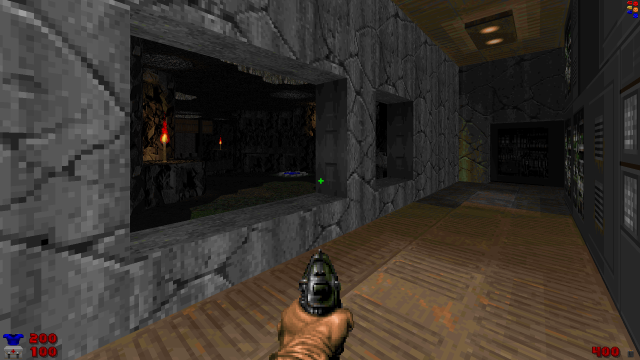 A lot of existing ZDoom maps at least kind-of-work in prBoom+. 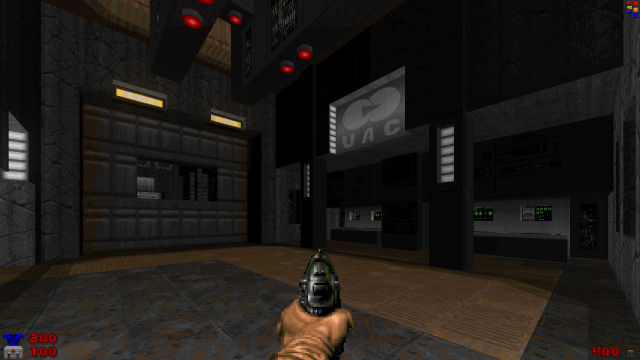 I played the map in prB+ because the OP didn't mention it was a ZDoom map, and 'for Doom 2' would indicate compatibility with vanilla or limit-removing. On the other hand, the map is so close to working properly in prBoom+ that using SLADE to create texture variants of the flats that are used as textures might not be too much to ask, in exchange for it being playable by more ports. Yeah, I should have sticked to plain Doom 2 format, I was avoiding the hassle of manually putting in flats that have been customized to be used as textures, not realising doing so would cause other issues. I'll think this over, just might go for adding the textures and convert to Boom instead. Still working on gameplay for a while, I'll get there eventually. Updated the download link in OP, it should be free of any bugs now and playable even on PrBoom+. Fixed a whole list of issues, mostly little things. 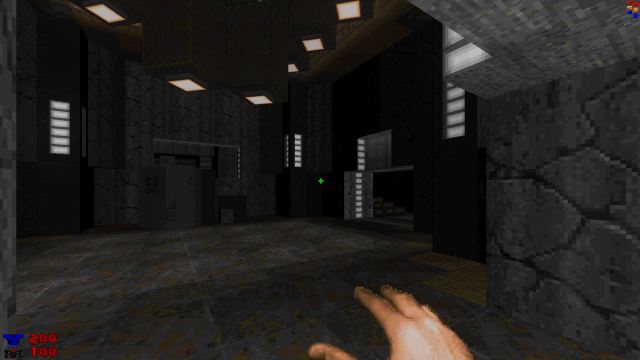 Its still in Zdoom (Doom in Doom format) but added some custom textures to make it playable in PrBoom+ as well. Think its still needs a lot more playtesting though, not satisfied with it yet. Also added an older map to join this one, since I wasn't doing anything with it so I thought it could be used for this. Also did some work on that map to make it a bit better. Its a map I released a while back, some might have played it already, but for those who didn't it might be worth a look. These two maps are a nice taste of the good old days of the mid-to-late 2000s. I liked that the majority of the opposition was low level, whilst the player could get steadily more powerful through secrets and the like. I was also very happy with the architecture and visual fidelity and embellishments - impressive how that 8 secrets over the 2 maps were still pretty easy to find despite what could've been a lot of visual noise. My only complaint was that it feels like half of the enemies are popping out behind you, which gets pretty tiresome even if they aren't that dangerous. Still, great work! Nice to see you back and making releases. most enemies being teleports/closet-scares, and hitscanners at that, effectively punishes the player for moving through the map. The way to win is to tip-toe around and when you hear a trap spring, backtrack at full speed to the last bottleneck and doorcheese the hitscanners. I get that a huge portion of doom players enjoy this ultra careful doorcheese thing, but for me the gameplay was a dogbarf. I'm not suggesting you change the gameplay, nor am I suggesting it's a bad map, like I said I think a lot of people enjoy that style, at least most non-speedrunner youtube playthroughs seem to play in this manner. Just giving my impression as someone who likes to sprint full retard into the middle of a room guns blazing, eating hits but grabbing medikits on the fly -not duck-and-cover potshots at hitscanners, not micro-managing "should I grab that stimpack even though I'm at 93/100?" etc. Just to clarify, the first two parts of the above (the "Zdoom" and "(Doom in") simply specify the editor profile that Doom Builder loads. It's perfectly possible to create map using the 'ZDoom (Doom in Doom format)' profile and it be even vanilla compatible. All it means is Doom Builder gives you the options of using ZDoom only features, and the drop down menus for actions and items etc. are ZDoom targeted. But the actual file at the end is the same format as the IWAD maps. And if you avoided using ZDoom specific features, it'll run just the same in any reasonably robust port like PRBoom+. It's the last bit of the profile name, the "Doom format" bit, that has the biggest impact. 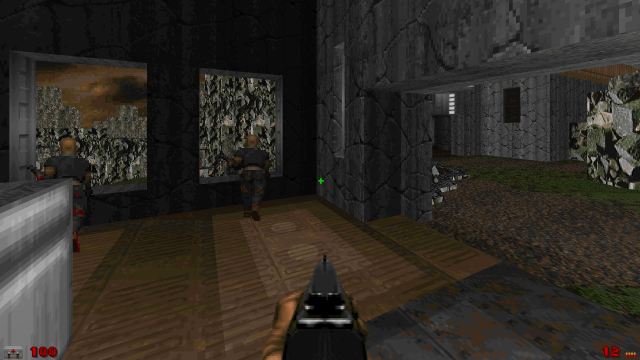 There are three fundamental map formats commonly in use: Doom, Hexen, and UDMF. Hexen is slightly different to Doom, UDMF is completely different. You try to run a UDMF map in PRBoom+ and it'll crash straight away, even if you don't use any advanced features at all. Thanks for the video, an enjoyable 25 minutes of useful footage of someone playing my map. I can see now why micro managing health and ammo is not very fun, meaning it affects gameplay in such a way that you have to alter your style of playing. Which I'm kinda forcing onto the player, but not intentionally. I can understand its not everone's favorite style of playing a Doom level, well if you're a speedrunner that is. I guess it all comes down to my own playstyle that I somehow incorporate into my levels, so my style of playing Doom is to be really careful entering a new area, and of course you'd expect it to filter into my maps when building them. Which in a way might not be a good thing, since I'm sort of forcing the player to play the level as I do play Doom. Which is fine if your the careful tip-toe kind of player, but if you're used to playing run and gun the experience will be different. I said in this thread before, building the map is the easy part, getting gameplay right is always tough as I'm not a pro Doom player, but more the casual kind. Well I'm probably more a pro when designing maps, but then you're only halfway there once the level is all build, you still have gameplay to worry about, and honestly you can't cut corners there or that beautiful detailed map isn't worth much. Making a Doom map is so much more than just building a level, I realise that, excecuting it properly is where the challenge lies. Thanks for your review, it gives me more things to think about. Seeing some traps there I'd want to change for the better.